Vicar’s is a fascinating place, part cafe, part bistro, part community centre, and has steadily grown a reputation in Saltaire for serving great food and getting involved in the community. Vicar’s is run by Andy Bowerman, a fully fledged Anglican vicar with a brief to create church for people who don’t go to church. He does this by running a fantastic little cafe during the day, which transforms into a homely and welcoming bistro on weekend evenings. The idea is that Vicar’s should be just a normal place, but one that’s run on a broadly Christian basis. You won’t be preached to at Vicar’s…you’re not eating in a church, but you will get some excellent organic, fairtrade food in a great setting that’s used in an inventive and enterprising way throughout the week, hosting a variety of community groups ranging from mother and baby groups through to an achingly hip knitting collective. The place is very community focused and has a strong theme of social justice, enterprise and charity. 10% of profits are given to AIDS charities in Africa. We’ve eaten at the weekend bistro several times, and it’s always impressed. Rustic wooden tables are arranged in a refectory style, which makes things very communal, and you’ll get to know your neighbours a little bit. The sharp eyed will notice that the chairs have clearly seen past service in a church, and come complete with a handy hymn book slot on the back. It’s a little odd at first, and probably not the the place to go for a romantic dinner for two, but in a group, it’s great fun and very relaxing and welcoming. Dinner covers an ambitious five courses, with at least a couple of choices at each stage. I had a really quite good pate de campagn to start with and was offered the other starter, a lovely roasted pepper, after I’d finished, as there were a few left and, well, they had to be eaten. It’s a small and simple gesture, but it shows perfectly what Vicar’s is about. 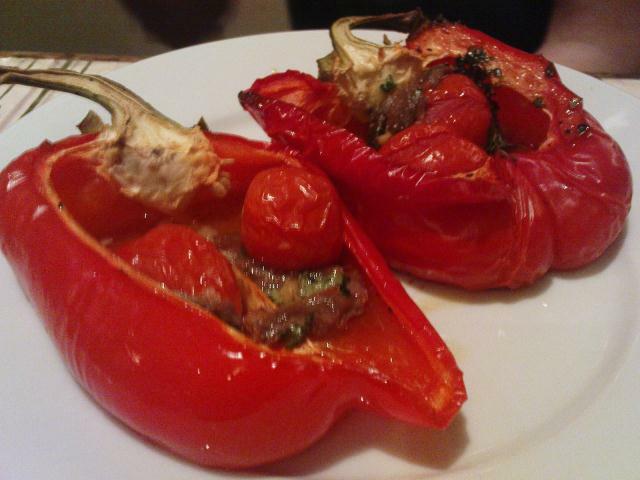 The pepper was stuffed with cherry tomatoes, anchovy and garlic, roasted until slightly blackened and sweet. An excellent dish. For the next course, I had a tasty parsnip and chestnut soup, rich and satisfying. An extremely good soup, of which, again, I was offered seconds. An alternative option of melon with a sorbet and some raspberries soaked in something alcoholic (vodka, I think) looked excellent. I can’t resist a nice roast dinner, so my choice of turkey surprised nobody. Three thick slices of moist and juicy turkey were served with a chestnut stuffing. As many will find out next Thursday, turkey can be a bit dry if overcooked, which this certainly wasn’t. Big bowls of roast potatoes and roasted root vegetables were passed around for people to help themselves. This was the best turkey dinner I’ve had this year, and, given that Christmas week is upon us, I’ve had quite a lot of turkey by now. I chose a plate of cheese for dessert, which was fine, but after eating two starters and an extra serving of the delicious soup, I couldn’t finish it. We moved upstairs to the cosy lounge for coffee from huge cafetière and a good chat. The food is good and honest, based around using quality organic, fair trade and locally sourced ingredients in a straightforward way. It’s not pretentious or gimmicky, the sort of cooking that everybody secretly loves, and at £17.50, it’s an absolute bargain. Service is friendly and efficient. The importance of Vicar’s as an experiment in modern community outreach shouldn’t be underestimated, and it’s interesting to note that the Archbishop of Canterbury has visited, and the Archbishop of York has even done a stint as ‘guest chef’, which is a small claim to fame that I guess not many restaurants can boast. Andy has taken a huge gamble in investing in and building Vicar’s, and it’s a triumph on all fronts. One final thing to note – Vicar’s isn’t licensed, so BYO. The off-license immediately opposite will be happy to oblige should you forget. There’s no corkage charge. We went tonight and had a really good night. All food was locally sourced and fair trade where possible. What I didn't know before I arrived was that Vicars rely on, very eager, volunteers to help to wash up and wait on tables. Loved the whole eating wherever there was a seat business! Our food was OK, I think it could have been better, but maybe that was just the chef that night (have heard really good reports of food before). The starter and pudding were good, the pork chop was dry and no consistency with apple sauce distribution! Fab if you want to get 20 people in one place at one time as you can book the whole place. I'll be back!